The cave and an adjacent tent are home to 18 people: Nawal’s father, his two wives and 15 children. The family’s 200 sheep are penned outside. An ancient generator that runs on costly diesel provides power for a maximum of three hours a day. Water is fetched from village wells, or delivered by tractor at up to 20 times the cost of piped water. During the winter, bitter winds sweep across the desert landscape, slicing through the tent and forcing the whole family to crowd into the cave for warmth. “In winter, we are stacked on top of one another,” Nawal tells me. Nawal is one of a second generation of Palestinians to be born into occupation. Her birth came 34 years after Israel seized the West Bank,Gaza Strip and East Jerusalem during the six-day war. Military law was imposed on the Palestinian population, and soon afterwards Israel began to build colonies on occupied land under military protection. East Jerusalem was annexed in a move declared illegal under international law. The first generation – Nawal’s parents and their peers – are now approaching middle age, their entire lives dominated by the daily grind and small humiliations of an occupied people. Around four million Palestinians have known nothing but an existence defined by checkpoints, demands for identity papers, night raids, detentions, house demolitions, displacement, verbal abuse, intimidation, physical attacks, imprisonment and violent death. It is a cruel mosaic: countless seemingly unrelated fragments that, when put together, build a picture of power and powerlessness. Yet, after 46 years, it has also become a kind of normality. For the young, the impact of such an environment is often profound. Children are exposed to experiences that shape attitudes for a lifetime and, in some cases, have lasting psychological consequences. Frank Roni, a child protection specialist for Unicef, the United Nations’ agency for children, who works in the West Bank, Gaza and East Jerusalem, speaks of the “inter-generational trauma” of living under occupation. “The ongoing conflict, the deterioration of the economy and social environment, the increase in violence – this all impacts heavily on children,” he says. “Psychological walls” mirror physical barriers and checkpoints. “Children form a ghetto mentality and lose hope for the future, which fuels a cycle of despair,” Roni says. Nawal’s village is inside an area designated in the 1980s by the Israeli army as “Firing Zone 918” for military training. The army wants to clear out eight Palestinian communities on the grounds that it is unsafe for them to remain within a military training zone; they are not “permanent residents”. A legal battle over the fate of the villages, launched before Nawal was born, is still unresolved. 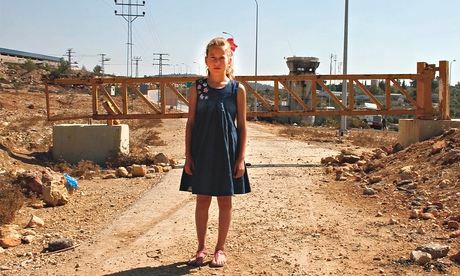 Like Nawal, 12-year-old Ahed Tamimi boldly asserts that she, too, has no fear of soldiers, before quietly admitting that sometimes she is afraid. Ahed’s apparent fearlessness catapulted her to a brief fame a year ago when a video of her angrily confronting Israeli soldiers was posted online. The girl was invited to Turkey, where she was hailed as a child hero.Amid tree-covered hills almost three hours’ drive north of Jinba, Nabi Saleh is a village of around 500 people, most of whom share the family name of Tamimi. From Ahed’s home, the Israeli settlement of Halamish is visible across a valley. Founded in 1977, it is built partly on land confiscated from local Palestinian families. An Israeli army base is situated next to the settlement.When settlers appropriated the village spring five years ago, the people of Nabi Saleh began weekly protests. Ahed’s parents, Bassem and Nariman, have been at the forefront of the demonstrations, which are largely nonviolent, although they often involve some stone-throwing. The Israeli military routinely respond with tear gas, stun grenades, rubber bullets, jets of foul-smelling fluid known as “skunk”, and sometimes live ammunition.Two villagers have been killed, and around 350 – including large numbers of children – injured. Ahed was shot in the wrist by a rubber bullet. At least 140 people from Nabi Saleh have been detained or imprisoned as a result of protest activity, including 40 minors. Bassem has been jailed nine times – four times since his daughter’s birth – and was named a “prisoner of conscience” by Amnesty International; Nariman has been detained five times since the protests began; and Ahed’s older brother, Waed, was arrested. Her uncle, Rushdie Tamimi, died two days after being shot by soldiers in November 2012. An Israel Defense Forcesinvestigation later found that soldiers fired 80 bullets without justification; they also prevented villagers giving medical aid to the injured man.Ahed, a slight, elfin-faced girl, is a discomforting mix of worldliness and naivety. For a child, she knows far too much about tear gas and rubber bullets, demolition orders and military raids. Her home, scarred by repeated army assaults, is one of 13 in the village that are threatened with being bulldozed. When I ask how often she has experienced the effects of tear gas, she laughs, saying she cannot count the times. I ask her to describe it. “I can’t breathe, my eyes hurt, it feels like I’m suffocating. Sometimes it’s 10 minutes until I can see again,” she says. Those working with Palestinian children say this is a common reaction. “When you live under constant threat or fear of danger, your coping mechanisms deteriorate. Children are nearly always under stress, afraid to go to school, unable to concentrate,” Frank Roni says. The flip side of Ahed’s life is one of poignant prosaicness. She plays hopscotch and football with her schoolfriends, likes movies about mermaids, teases her brothers, skips with a rope in the sitting room. But she shrinks from the suggestion that we photograph her near the army watchtower at the entrance to the village, only reluctantly agreeing to a few minutes within sight of the soldier behind the concrete. Her answers to questions about what the protests are over and the role of the army seem practised, the result of living in a highly politicised community. “We want to liberate Palestine, we want to live as free people, the soldiers are here to protect the settlers and prevent us reaching our land.” With her brothers, she watches a DVD of edited footage showing her parents being arrested, their faces contorted in anger and pain, her own confrontation with Israeli soldiers, a night-time raid on the house, her uncle writhing on the ground after being shot. On top of witnessing these events first-hand, she relives them over and over again on screen. 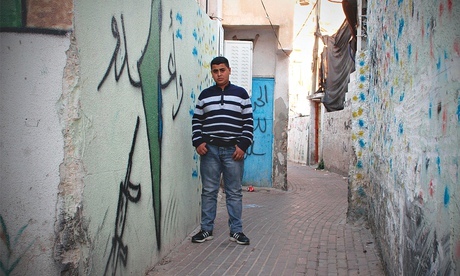 In Tel Rumeida, Waleed’s neighbourhood, almost all the Palestinian residents have left. Only the Abu Aishes and another family remain on his street, alongside new settler apartment blocks and portable buildings. Waleed lives much closer to his settler and soldier neighbours than either Ahed Tamimi or Nawal Jabarin: from his front window, you can see directly into settler homes a few metres away. Next door to his home is an army base housing around 400 soldiers. Following violent attacks, stone-throwing, smashed windows and repeated harassment from settlers, the Abu Aishes erected a steel mesh cage and video cameras over the front of the three-storey house where the family has lived for 55 years. When not at school, Waleed spends almost all his time inside this cage. “For me, this is normal,” he says. “I got used to it. But it’s like living in a prison. No one can visit us. The soldiers stop people at the bottom of the street, and if they are not from our family, it’s forbidden for them to visit. There is only one way to our house, and the soldiers are there day and night. I don’t remember anything else: they have been here since I was born.” Despite his “normality”, he wishes his friends could come to the house, or that he and his brother could play football on the street. The cage, and public condemnation that erupted in Israel following the broadcast on television of a Jewish woman hissing “whore” in Arabic through the mesh at female members of the Abu Aishe family, have reduced settler attacks and abuse. But Waleed still gets called “donkey” or “dog”, and is sometimes chased by settler children. A 2010 report by the children’s rights organisation Defence for Children International (DCI) said Palestinian children in Hebron were “frequently the targets of settler attacks in the form of physical assaults and stone-throwing that injure them” and were “especially vulnerable to settler attacks”. Stone-throwing by Palestinian children at settlers and security forces is common, sometimes causing injuries and even deaths. Bassem Tamimi neither advocates nor condemns it: “If we throw stones, the soldiers shoot. But if we don’t throw stones, they shoot anyway. Stone-throwing is a reaction. You can’t be a victim all the time,” he says. Muslim’s detentions have followed a typical, well-documented pattern. Between 500 and 700 Palestinian children are arrested by Israeli security forces each year, most accused of throwing stones. They are often arrested at night, taken away from home without a parent or adult accompanying them, questioned without lawyers, held in cells before an appearance in court. Some are blindfolded or have their hands bound with plastic ties. Many report physical and verbal abuse, and say they make false confessions. 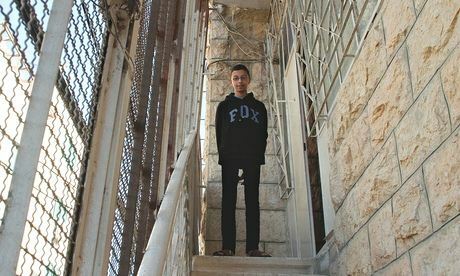 According to DCI, which has taken hundreds of affidavits from minors in the West Bank and East Jerusalem, these children are often pumped for information on relatives and neighbours by their interrogators. Muslim has been held for periods varying from a few hours to a week. The moment when children realise their parents, especially their fathers, cannot protect them is psychologically significant, according to experts. “For children, their fathers are the protectors of the family. But often these men reach a point where they cannot protect their children. Sometimes soldiers humiliate fathers in front of children. This is very difficult for children who naturally see their father as a hero,” Zaghrout says. But growing up under occupation is shaping another generation of Palestinians. The professionals who work with these children say many traumatised youngsters become angry and hopeless adults, contributing to a cycle of despair and violence. “What we face in our childhood, and how we deal with it, forms us as adults,” Zaghrout says. ← Iraq body count, year 2013.